(by Betsy McCaughey, NYPost) – President Obama said last Thursday that he doesn’t “have a strategy yet” to combat ISIS in the Middle East. Worse is what he didn’t say – not one word about how to prevent ISIS from attacking us here at home. That’s despite security experts warning Congress repeatedly that we should take seriously ISIS’ gory threats to spill American blood on our soil, not just beheadings over there. Compare Obama’s inaction to Prime Minister David Cameron’s decisive action. British Prime Minister David Cameron returned from his vacation after only 1 day upon hearing of the beheading of American journalist James Foley by ISIS. After Britain last week raised the terror-threat assessment there to “severe,” meaning an attack is “highly likely,” Cameron called for revoking passports of British citizens returning from Syria and Iraq and cracking down on jihadist recruiters, even by censoring the Internet and rounding up extremist organizers. These proposals are sparking a lively debate in Britain over balancing security and civil rights. 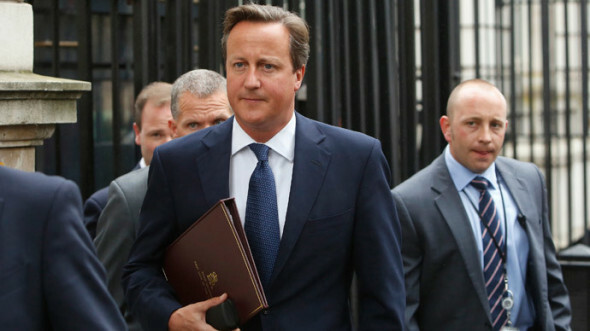 Meanwhile, Cameron worked through the weekend to bring several proposals to the House of Commons on Monday. That’s the same weekend President Obama spent at a barbecue, two fund-raisers and the wedding of the White House chef. Also MIA are House Speaker John Boehner, off on a 14-state fund-raising bus tour, and Senate Majority Leader Harry Reid, busy politicking in Nevada. Yet when there’s a leadership vacuum in the White House, Congress needs to step in. That means getting to work on thwarting jihadists with US or European passports from importing ISIS-style terror here. A year ago, on Aug. 23, 2013, then-FBI Director Robert Mueller raised that danger in an ABC News interview. Just days before breaking for August vacation, Congress was alerted again. On July 29, security expert Max Boot warned that ISIS is a “clear and present danger” to America, a warning repeated by several other expert witnesses. Spasms of ISIS violence are already occurring in the West. On May 24, Mehdi Nemmouche, a Frenchman who spent 11 months fighting with ISIS in Syria before returning to Europe, opened fire at the Jewish Museum in Brussels, killing four. It’s common sense that Americans who’ve gone to the Middle East to fight with ISIS should be barred from returning, yet so far nothing is being done. We’ve already heard of ISIS fighters Douglas McCain from Illinois, Moner Mohammad Abusalha from Vero Beach, Fla., and Mohammad Hamdan from Detroit. Who knows for sure how many more there are? The US government can and should revoke the passports of any Americans who’ve joined up with ISIS. Contrary to what many believe, international travel is not a fundamental constitutional right. Federal courts have ruled that citizens can have their passports revoked or be put on a No Fly List. The only condition is that they get due process, meaning they’re told about it and get a hearing after the fact. Congress should also bar travel to countries like Syria, where terrorists run training camps. Anyone wanting to go would have to get US government clearance. That’s the substance of a pending bill, H.R. 4223, intended to close off regions that could be launching pads for terror attacks here. These precautions won’t eliminate the danger entirely. (For example, ISIS is reportedly making fraudulent passports, and there are other ways to sneak into the country.) But not taking these precautions is foolhardy. Time is short. The House reconvenes on Monday, Sept. 8 and will meet for only 12 days before its members take off again to campaign for the November elections. Reid plans to close up shop in the Senate even sooner. With no time to spare, lawmakers will have to pass spending bills for the coming year, among other matters. In view of the ISIS threat, you’d think Boehner and Reid would shorten the August vacation and call a special session. But golf and politicking seem to preoccupy them as well as the president. Betsy McCaughey is author of “Government by Choice: Inventing the US Constitution” and a former lieutenant governor of New York. Published September 2, 2014 at The New York Post. Reprinted here September 4, 2014 for educational purposes only. 2. What problem does Ms. McCaughey lay out? 3. What solution does she present? a) Do you agree with Ms. McCaughey’s assertion? Explain your answer. CHALLENGE QUESTION: List at least 3 qualities necessary for an effective leader (in government). Keep in mind the qualities needed to deal with the spread of terrorism and the immigration crisis, conflicts in Ukraine, Israel/Gaza, Libya, Somalia, et al. Which leaders in our government do you think exhibit all three of these qualities?